Among the many excellent sessions at the Food Security Forum in Beijing in June, Michael Lee of Rothamsted Research and the University of Bristol discussed critical sustainability issues in his talk entitled “Steps toward sustainable livestock – the balance between yield and impact.” Lee noted four key challenges facing the globe as we strive to achieve food security for the expected 9 billion inhabitants of the planet by 2050 – 1) increasing population growth, 2) increasing urbanization, 3) climate change, and 4) increasing demand for animal protein. These challenges are formidable and will require a critical “balancing act” as referenced in the World Resources Institute’s 2013 report (Creating a Sustainable Food Future). In his talk, Lee brought up a key point that is beginning to get more attention – the notion of the Earth’s carrying capacity – which is of course limited. He noted that we are currently exceeding planetary boundaries; a situation which cannot last forever. Lee pointed out that to feed everyone on the planet right now with a Western-style diet, we would need another 1.5 planets. And to do the same by 2050, we would need 5.5 more planets. Since we obviously can’t add more planets to extricate ourselves from our ecological challenges, we must act more sustainably and live within the biological constraints of our one Earth. Lee also referenced FAO’s work in pointing out that by 2050 global food demand is expected to increase by 70%. With limited productive land areas to draw on, we therefore have no choice but to achieve sustainable intensification – producing more food with fewer resources, and with reduced negative impact on the environment. As Lee suggested in his talk, we not only must reduce our reliance on fossil fuels and inorganic fertilizers, we must also change our behavior and begin placing a much greater value on our food resources. Further, as Lee noted, we need a multi-disciplinary approach to solving the challenge of feeding nine billion people by 2050. There is no silver bullet. Achieving success will require the pursuit and implementation of a number of initiatives simultaneously. One of these initiatives will undoubtedly involve reducing food loss and waste across the globe – the low hanging fruit of the nine billion by 2050 challenge. A case in point: As noted in the Institution of Mechanical Engineers’ “Global Food: Waste Not, Want Not” report, the world wastes between 30% and 50% of all food produced annually, with between 1.2 and 2 billion tons of annual food production never reaching a human stomach. This immense waste occurs despite the fact that over 800 million people in the world remain hungry, and billions suffer from micronutrient deficiencies. We are clearly in need of a collaborative, multi-faceted, global approach to attack the problem of food waste. Such an approach starts with increased awareness, and also requires concerted education efforts and messaging campaigns. Toward that end, I was pleased to see an impactful messaging campaign by the United Nations Education Programme (UNEP) upon arrival in Beijing’s airport. Completed to highlight World Environment Day (June 5), the campaign emphasized the need for behavior change in terms of resource consumption with the slogan “Seven Billion Dreams. One Planet. Consume with Care.” UNEP notes that we are currently consuming far more resources than the planet can sustainably provide, and that many of the Earth’s ecosystems are nearing “tipping points” of depletion/irreversible change. Further, the organization warns that if current consumption production patterns persist, we will require an additional three planets by 2050 to sustain our lifestyles. 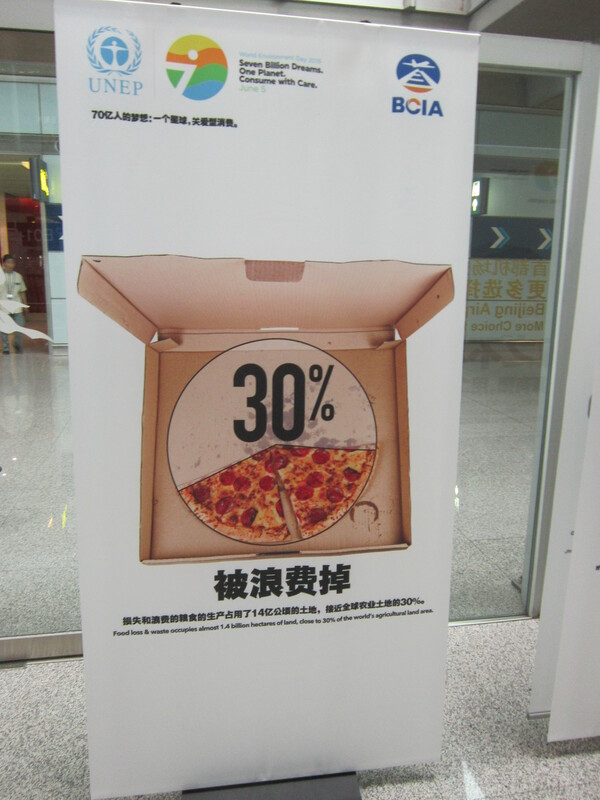 These messages have undoubtedly impacted a large percentage of the 80 million annual passengers passing through Beijing’s airport, and they should be replicated in industrialized countries like the U.S. as part of national education campaigns to reduce food loss and waste. Exceeding the carrying capacity of the Earth isn’t sustainable in the long term, and we can’t rely on additional planets to solve our food, water, and energy challenges. As UNEP notes, it’s time to consume with care. That’s a message that needs to be communicated early and often in our schools, and emphasized in our business and political institutions, to lay the groundwork for a collaborative, scaled effort to reduce food waste and redirect those resources to productive use.